I went Saturday for a ride up in the McDowell / Sonoran Preserve in Scottsdale, AZ. Many of the group were doing the 'Quadruple Bypass' ride. Thus named because you climb up and over 4 passes as you circumnavigate the preserve. I ended up just doing a 'Double Bypass' which was enough for me mileage wise. I need to get out and do these trails more often. They are such a bear to climb up that you get a tremendous workout, even if you have to push/carry your bike uphill for part of the way! 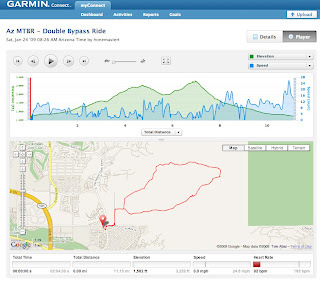 The Garmin 'Connect' website looks like it's gone through some upgrades as of late. Check out this link to the data from the ride that day. You can play it back in your web browser, and it steps through the waypoints and annotates the data. Pretty neat! The engineer in me loves this kind of stuff, although the truth of the data is sometimes a bit of a blow to the ego!